What is a wrist joint denervation? Will this not lead to dysesthesias in the hand? Then what is the purpose of a wrist joint denervation? What are the conditions which oftentimes lead to a wrist joint denervation? So does the thinner layer of cartilage lead to pain? Is a denervation the ideal procedure to address wrist joint osteoarthritis? Why not opt for a partial or total fusion right away? Does wrist joint denervation only make sense as long as there is good wrist joint mobility? The image shows the course of the most important nerve tracts in a wrist, which are responsible for transmitting the pain from the wrist to the central nervous system. A German hand surgeon (Wilhelm) was the first one to implement the surgical procedure known as wrist joint denervation. The fundamental idea of the wrist joint denervation consists in interrupting the pain-conducting nerves which run from the wrist to the brain by surgical procedure. No. When using the correct technique only the pain conducting nerve tracks in the wrist will be interrupted. The sensory nerves responsible for the skin sensation will not be harmed. One can easily explain the effect of a denervation by the example of an alarm clock. Just imagine an alarm clock which constantly goes off very loudly and keeps going on (this pretty much compares to a painful osteoarthritis). Now if it is not possible to come up with a causal therapy to address the osteoarthritis, this constant “ringing alarm clock” (severe pain) will become very bothersome to the affected patient at some point. The denervation will achieve that a considerable amount of pain-conducting nerves will be interrupted. In our example this will lead to a substantial reduction of the noise disturbance caused by the alarm clock. A complete shut-down of the alarm clock /pain may however not be achieved through denervation. The severance of the pain-conducting nerve tracks will not cure the actual wrist joint damage. Therefore a denervation should only be contemplated when the damage to the wrist joint cannot be causally addressed. To be very clear: Denervation is not a substitute procedure for therapy geared towards the true remedy of the root cause of the pain. Tumor, located in the distal area of the radius. It is strictly reserved for all those conditions or injuries which do not or no longer allow for causal treatment of the issue. 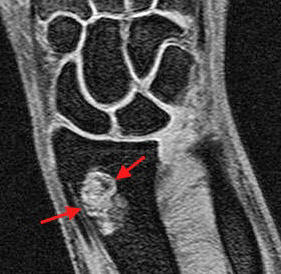 The image to the left shows an MRT with a tumor in the distal radius. In a case like that the surgeon will remove the tumor; he will not cut the pain-conducting nerve to eliminate the pain caused by the tumor. 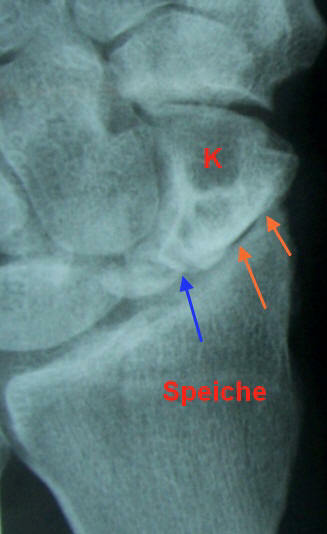 The image above shows an advanced osteoarthritis between radius and scaphoid bone. In a majority of cases denervation procedures will be performed in case of osteoarthritis of the wrist joint. Osteoarthritis in wrist joints may be caused by improperly healed fractures of the radius; poorly healed long-existing scaphoid bone fractures or even long-existing damages to the ligaments (wrist joint ligaments). The image above shows a case of severe osteoarthritis in a wrist joint due to a not healed scaphoid bone fracture. No surgical intervention can heal the fracture (nor the osteoarthritis resulting thereof) in this case! Similar to hips or knees osteoarthritis in wrist joints may also develop as a result of personal predisposition. All these osteoarthritic alterations have one thing in common: all of them hurt but for none of them the actual root cause can be eliminated at the time it is diagnosed. A joint is a combination of two or more flexibly joined bones which do however not bump into each other. Those areas forming the joint are covered with a specific layer called cartilage. You may picture the cartilage tissue of a joint as the plaster of a wall. If affected by osteoarthritis the cartilage layer becomes considerably thinner. In severe cases it may even get completely destroyed. In this case bone will rub against bone as opposed to a healthy joint where cartilage rubs against cartilage. Yes. In the beginning the symptoms will most likely show when the joint is under strain, later they will appear even when slightly moved or when kept still. In about sixty percent of the cases a denervation will lead to pain reduction or even pain elimination for up to years. However, since the denervation will not stop the progressing osteoarthritis, in many cases years later the pain returns. Personal or professional reasons may very well justify the need to retain as much wrist joint mobility as possible for as many as possible years prior to commit to a partial or even total fusion of the wrist joint (e.g. after retirement, etc.). • retaining the remaining mobility of the wrist.